Something magical is coming to Centerville, Utah! 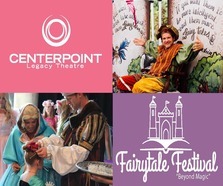 Back by popular demand, CenterPoint Legacy Theatre is pleased to announce the 6th annual Fairytale Festival to be held at the Theatre on September 14th and 15th, 2018. Come meet your favorite fairytale characters from roguish pirates, to adventurous princesses! Face Painting, Fairy House and wand making, among other fanciful fairytale crafts will be available. Build-A-Castle, medieval carnival games, balloon animals, a bouncy castle, and much, much more will be provided to delight family members of all ages! Admittance to the festival is FREE as are many of the activities! Some craft booths have a fee. Princess Tea Party, where princesses will be treated to a pinkalicious tea party hosted by Mrs. Potts and attended by an array of favorite princesses. Daddy-Daughter Ever-After Royal Ball, a once-upon-a dream evening where Daddies can bring their princesses to dance, dine on sweet treats, mingle with fairytale characters and make a memory that will live happily ever after. Captain Hook Scalawag School is an adventure-filled 30 minutes of the art of piracy right down to mastering the perfect “arrrrgh”. Wizarding 101 is an escape into the world of wizards and the care of magical creatures.